Ian Stewart is well known for his entertainingly written and illuminating expositions on mathematics and mathematically related topics. There is no doubt that he has a gift for transforming mathematically complicated concepts and ideas into plain understandable language for the novice (and even the professional mathematician). This current book is no exception. 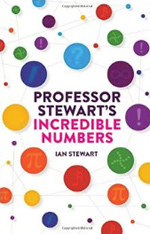 The title of Stewart's book is, I believe, a little misleading as it is much more than a mere exposé of "incredible" numbers. Indeed, the numbers are perhaps a convenient way of introducing a wide variety of intriguing mathematical ideas and approaches in areas such as geometry, set theory, chaos, string theory, music, art and infinity. Of course, this is not to say that the numbers themselves are obscured only to be remarked upon in such a way as to merely facilitate discussion of a particular theory; they are in their own right treated with appropriate reverence. A novel approach in the way chapters are numbered throughout the book is through their ordering – which can take one by surprise and even induce one into believing that a catastrophic gallery of printing errors has taken place. However, this is only Stewart's little joke with the reader and is in fact quite logical as the reader progresses through the chapters: 1, 2, 3, 4, 5, 6, 7, 8, 9, 10, 0, -1, …, 6670903752021072936960, …, 42. The book ends on chapter 42 – is this perhaps the most interesting number in the book because it is the most boring number in the Universe?! The book is essentially divided in to ten sections. Each section is categorised in terms of a special number or combination of numbers. The book begins with a rather interesting historical account of the origin of numbers and the representation of number systems. The first ten chapters then loosely parallel their contents; for example, chapter 2 will discuss two-ness: even and odd, binary numbers and quadratic equations. Similarly, in chapter 4 one will encounter four-ness: squares, the four colour problem, etc. Of course, every number is special, but there are certain numbers that tend to ignite a particular curiosity within us. Irrational numbers, such as π and √2, were allegedly discovered by a Pythagorean called Hippasus of Metapontum whilst at sea. The story goes that his fellow Pythagoreans threw him overboard for bringing into disrepute the Pythagorean doctrine "…that all phenomena in the Universe can be reduced to whole numbers and their ratios." Regardless of whether this story is true or false, irrational numbers play an extremely important role not only in mathematics, but science, technology and all other mathematically related areas. Other equally fascinating irrational numbers considered by Stewart are the golden number (important in numerology and plant geometry), the exponential (this number arises when the rate of increase or decrease in, for example, the human population or radioactivity is discussed) and fractals (infinitely repeating patterns at all scales of which the snowflake curve is perhaps the most recognisable). The section entitled Special small numbers highlights some very interesting snippets, in amongst other things theoretical physics, probability and geometry. In Stewart's discussion of string theory and M-theory, we learn that these theories require extra dimensions of space-time for them to be mathematically consistent: ten-dimensions for string theory, while M-theory is eleven-dimensional. One has, therefore, to assume that the extra dimensions are wrapped up so incredibly small that they are unobserved in experiments. If you want to impress at a party then Chapter 23 in this section will do the trick – provided they are not mathematicians. In fact, I tested this one out many years ago with some friends. What is so special about the number 23? Well, I betted them that at least one pair of Presidents of the USA shared the same birthday. At the time there had been 40 so I had well over 50% chance of being correct, and I was – just! But you will have to read the book to understand why I felt confident about winning the bet. What Professor Stewart's Incredible Numbers does not do, and does not claim to do, is expand upon the topics under discussion in any great detail, which is clearly not the point of the book. What the book does very well is to introduce the reader via an array of seemingly peculiar looking numbers to some very interesting mathematical concepts that arise in quite astonishing ways. But if you always wanted to know the secrets behind Sudoku, Rubik's cube or perhaps invent your own secret code this is the book for you. By the way, did you know that there was a number larger than infinity? Dr Peter O'Donnell lectures in the Department of Applied Mathematics and Theoretical Physics at the University of Cambridge and is a Fellow of St. Edmund's College. His research interests are general relativity and quantum gravity.